American test pilot astronaut 1962-1974. Third person on the moon. Only astronaut to fly Gemini, Apollo, and Skylab. Commander of first successful space station mission. Status: Deceased; Active 1962-1974. Born: 1930-06-02. Died: 1999-07-09. Spaceflights: 4 . Total time in space: 49.15 days. Birth Place: Philadelphia, Pennsylvania. US Naval aviator prior to astronaut selection. Died in a motorcycle crash. PERSONAL DATA: Born June 2, 1930, in Philadelphia, Pennsylvania. Died July 8, 1999, from injuries sustained in a motorcycle accident in Ojai, California. Conrad, who divorced his first wife, is survived by his wife Nancy, three sons and seven grandchildren. A son preceded him in death. EDUCATION: Attended primary and secondary schools at Haverford School in Haverford, Pennsylvania, and the Darrow School, New Lebanon, New York; received a bachelor of science degree in Aeronautical Engineering from Princeton University in 1953; an honorary master of arts degree from Princeton in 1966; an honorary doctorate of laws degree from Lincoln-Weslyan University in 1970, and an honorary doctorate of science degree from Kings college, Wilkes-Barre, Pennsylvania in 1971. ORGANIZATIONS: Fellow, American Astronautical Society; New York Academy of Science; American Institute of Aeronautics and Astronautics, and a Fellow of the Society of Experimental Test Pilots. SPECIAL HONORS: Awarded Congressional Space Medal of Honor (October 1978); awarded two NASA Distinguished Service Medals, two NASA Exceptional Service Medals, the Navy Astronaut Wings, two Navy Distinguished Service Medals, and two Distinguished Flying Crosses; recipient of Princeton's Distinguished Alumnus Award for 1965; the U.S. Jaycee's 10 Outstanding Young Men Award in 1965; American Astronautical Society Flight Achievement Award for 1966; Pennsylvania's Award for Excellence in Science and Technology in 1967 and 1969; the Rear Admiral William S. Parsons Award for Scientific and Technical Progress in 1970; Godfrey L. Cabot Award in 1970; Silver Medal of the Union League of Philadelphia in 1970; the FAI Yur Gagarin Gold Space Medal and the De La Vaulx Medal in 1970 for Apollo 12; National Academy of Television Arts and Sciences Special Trustees Award in 1970; Federal Aviation Agency's Space Mechanic Technician Award in 1973; the Collier Trophy in 1973; FAI gold Medal and the De La Vaulx Medal in 1974 for Skylab I, and the AIAA Haley Astronautics Award in 1974 for Skylab I; the Harmon Trophy in 1974; enshrined in the Aviation Hall of Fame in 1980. AEROSPACE AND PROFESSIONAL EXPERIENCE: Following graduation from Princeton University in 1953, Mr. Conrad entered the Navy and became a naval aviator. He then attended the Navy Test Pilot School at Patuxent River, Maryland, where he was assigned as a Project Test Pilot. Mr. Conrad also served as a flight instructor and performance engineer at the Test Pilot School. After completing his tour of duty at Patuxent River, he served as instructor pilot in F4H Phantoms on VF-121 and was then assigned duty in VF-96 on board USS Ranger. In September of 1962, Mr. Conrad was selected as an astronaut by NASA. His first flight was Gemini V, which established the space endurance record and placed the United States in the lead for man-hours in space. As commander of Gemini XI, Mr. Conrad helped to set a world's altitude record. He then served as commander of Apollo XII, the second lunar landing. On Mr. Conrad's final mission, he served as commander of Skylab II, the first United States Space Station. In December 1973, after serving 20 years (11 of which were as an astronaut in the space program), Mr. Conrad retired from the U.S. Navy to accept a position as Vice President - Operations and Chief Operating Office of American Television and Communications Corporation (ATC). At ATC, he was responsible for both the operation of existing systems and the national development of new cable television systems. In 1976, he resigned from ATC to accept the position of Vice President and consultant to McDonnell Douglas Corporation. In 1978, he became Vice President of marketing and was responsible for all commercial and military sales for Douglas Aircraft Company. Mr. Conrad then became Senior Vice President-Marketing in 1980. He was appointed as Senior Vice President Marketing and Product Support in 1982 and 1984, was named Staff Vice President of International Business Development for McDonnell Douglas Corporation. In 1990, Mr. Conrad became Staff Vice President - New Business for McDonell Douglas Space Company, where he participated in research and development for the Space Exploration Initiative. Included for research and development in the Space Exploration Initiative are the construction of Space Station Freedom, the return to and colonization of the Moon, and the exploration of Mars. Mr. Conrad contributed his expertise on SSTO, the Single-Stage-To-Orbit and return space transportation system called the Delta Clipper. In 1993, Mr. Conrad became Vice President-Project Development. Mr. Conrad died July 8, 1999 from injuries sustained in a motorcycle accident in Ojai, California. BIRTHPLACE AND DATE: Born June 2, 1930, in Philadelphia, Pennsylvania. PHYSICAL DESCRIPTION: Conrad is 5 feet 6 1/2 inches tall and weighs 145 pounds. EDUCATION: Attended primary and secondary schools at Haverford School in Haverford, Pennsylvania, and the Darrow School, New Lebanon, New York; received a Bachelor of Science degree in Aeronautical Engineering from Princeton University in 1953; an Honorary Master of Arts degree from Princeton in 1966; an Honorary Doctorate of Laws degree from Lincoln- Weslyan University in 1970, and an Honorary Doctorate of Science degree from Kings College, Wilkes-Barre, Pennsylvania in 1971. MARITAL STATUS: Married to the former Jane DuBose of Uvalde, Texas, and has four sons: Peter, December 25, 1954; Thomas, May 3, 1957; Andrew, April 30, 1959; and Christopher, November 26, 1960. OTHER ACTIVITIES: His hobbies include golf, water skiing and automobile racing. SPECIAL HONORS: Awarded Congressional Space Medal of Honor (October 1978); awarded two NASA Distinguished Service Medals, two NASA Exceptional Service Medals, the Navy Astronaut Wings, two Navy Distinguished Service Medals, and two Distinguished Flying Crosses; recipient of Princeton's Distinguished Alumnus Award for 1965; the U.S. Jaycee's 10 Outstanding Young Men Award in 1965; American Astronautical Society Flight Achievement Award for 1966; Pennsylvania's Award for Excellence in Science and Technology in 1967 and 1969; the Rear Admiral William S. Parsons Award for Scientific and Technical Progress in 1970; Godfrey L. Cabot Award in 1970; Silver Medal of the Union Leagp5Pof Philadelphia in 1970; the FAI Yur Gagarin Gold Space Medal and the De La Vaulx Medal in 1970 for Apollo 12; National Academy of Television Arts and Sciences Special Trustees Award in 1970; Federal Aviation Agency's Space Mechanic Technician Award in 1973; the Collier Trophy in 1973; FAI Gold Medal and the De La Vaulx Medal in 1974 for Skylab I, and the AIAA Haley Astronautics Award in 1974 for Skylab I; the Harmon Trophy in 1974; enshrined in the Aviation Hall of Fame in 1980. EXPERIENCE: Conrad entered the Navy following graduation from Princeton University and became a naval aviator. He attended the Navy Test Pilot School at Patuxent River, Maryland and, upon completing that course of instruction, was assigned as a project test pilot in the armaments test division there. He also served at Patuxent as a flight instructor and performance engineer at the Test Pilot School. He has logged more than 6,500 hours flying time, with more than 5,000 hours in jet aircraft. Conrad was spacecraft commander of Apollo 12, November 14- 24, 1969. With him on man's second lunar landing mission were Richard Gordon, command module pilot, and Alan Bean, lunar module pilot. In accomplishing all of the mission's objectives, the Apollo 12 crew executed the first precision lunar landing, bringing their lunar module, "Intrepid," to a safe touchdown in the moon's Ocean of Storms. Along with Bean, Conrad spent 7 hours and 45 minutes on the lunar surface performing the first lunar traverse deploying the Apollo Lunar Surface Experiment Package (ALSEP), installing a nuclear power generator station which would provide the power source for long-term scientific experiments, gathering geologic samples of the lunar surface for return to Earth, and completing a close-up inspection of the Surveyor III spacecraft. As spacecraft commander on his fourth flight, Conrad flew the first manned Skylab mission which launched on May 25 and terminated on June 22, 1973. With him for the initial activation and 28-day flight qualification operation of Skylab Orbital Workshop were Joseph Kerwin, science-pilot, and Paul Weitz, pilot. Although subjected to a 10-day delay in their planned launch, Conrad, Kerwin and Weitz managed to complete 46 of 55 scheduled experiments and all of the nine programmed subsystem/operation detailed test objectives. Paramount to the completion of these objectives was deployment of a "parasol" thermal shade to alleviate the orbital workshop thermal problem created by loss of the micrometeoroid shield during the launch of the Skylab workshop. Also vital to the mission was a 3-hour and 23- minute extravehicular activity by Conrad and Kerwin to deploy the jammed solar wing. Their success in extending the only remaining solar array system wing assured sufficient power for the conduct of the full 28-day mission and would provide the needed energy to power the subsequent Skylab 2 and Skylab 3 manned missions. In logging 672 hours and 49 minutes each aboard the workshop, the crew established a new world record for a single mission, and Conrad captured the individual endurance record for time in space by bringing this total space flight time to 1,179 hours and 38 minutes. Conrad has also logged 14 hours and 19 minutes in extra-vehicular activities. March 1, 1976, became a Vice President, Commercial Sales International, McDonnell Douglas Corporation, St. Louis, Missouri. In October 1978, was promoted to Vice President, Marketing, of the Douglas Aircraft Company. In October 1980, Conrad was promoted to Senior Vice President, Marketing, of the Douglas Aircraft Company. September 1969 to March 1971, Consultant, Butler Aviation, Inc., Englewood Cliffs, New Jersey. July 1970 to Present, Director, Hamilton Funds, Inc.; Hamilton Growth Fund, Inc. and Hamilton Income Fund, Inc., Denver, Colorado. December 1973 to 1976, Member/Consultant, National Aeronautics and Space Administration, Space Systems Committee, Washington, D.C.
September 1974 to February 1976, Consultant, Martin Marietta Corporation, Large Space Telescope Program, Denver, Colorado. January 1978 to Present, Consultant, Raytheon Marine Company, Sorensen Company, Manchester, New Hampshire. February 1981, Advisory Director, Martin Aviation, Santa Ana, California. As of 1999, Staff Vice President for International Business Development, McDonnell Douglas Corporation, St. Louis, Missouri. In 1995, he formed his own company, Universal Space Lines, and several sister companies with the goal of commercialising space. His objective was to go back to space as an entrepreneur, creating inexpensive methods of satellite launch and management. Family: Astronaut. Country: USA. Spacecraft: Gemini, Skylab. Flights: Gemini 5, Gemini 8, Gemini 11, Apollo 503, Apollo 9, Apollo 12, Skylab 2. Projects: Apollo. Agency: USN. Bibliography: 12, 5280. 1930 June 2 - . Birth of Charles Peter Jr 'Pete' Conrad - . Nation: USA. Related Persons: Conrad. American test pilot astronaut 1962-1974. Third person on the moon. Only astronaut to fly Gemini, Apollo, and Skylab. Commander of first successful space station mission. 4 spaceflights, 49.2 days in space. Flew to orbit on Gemini 5 (1965), Gemini 11, Apollo 12, Skylab 2. 1966 March 16 - . 16:41 GMT - . Launch Site: Cape Canaveral. Launch Complex: Cape Canaveral LC19. LV Family: Titan. Launch Vehicle: Titan II GLV. Gemini 8 - . Call Sign: Gemini 8. Crew: Armstrong, Scott. Backup Crew: Conrad, Gordon. Payload: Gemini SC8. Mass: 3,788 kg (8,351 lb). Nation: USA. Agency: NASA Houston. Class: Manned. Type: Manned spacecraft. Flight: Gemini 8. Spacecraft: Gemini. Duration: 0.45 days. Decay Date: 1966-03-17 . USAF Sat Cat: 2105 . COSPAR: 1966-020A. Apogee: 264 km (164 mi). Perigee: 160 km (90 mi). Inclination: 28.90 deg. Period: 88.80 min. The Atlas-Agena target vehicle for the Gemini VIII mission was successfully launched from KSC Launch Complex 14 at 10 a.m. EST March 16. The Gemini VIII spacecraft followed from Launch Complex 19 at 11:41 a.m., with command pilot Neil A. Armstrong and pilot David R. Scott aboard. The spacecraft and its target vehicle rendezvoused and docked, with docking confirmed 6 hours 33 minutes after the spacecraft was launched. This first successful docking with an Agena target vehicle was followed by a major space emergency. About 27 minutes later the spacecraft-Agena combination encountered unexpected roll and yaw motion. A stuck thruster on Gemini put the docked assembly into a wild high speed gyration. Near structural limits and blackout, Armstrong undocked, figuring the problem was in the Agena, which only made it worse. The problem arose again and when the yaw and roll rates became too high the crew shut the main Gemini reaction control system down and activated and used both rings of the reentry control system to reduce the spacecraft rates to zero. This used 75% of that system's fuel. Although the crew wanted to press on with the mission and Scott's planned space walk, ground control ordered an emergency splashdown in the western Pacific during the seventh revolution. The spacecraft landed at 10:23 p.m. EST March 16 and Armstrong and Scott were picked up by the destroyer U.S.S. Mason at 1:37 a.m. EST March 17. Although the flight was cut short by the incident, one of the primary objectives - rendezvous and docking (the first rendezvous of two spacecraft in orbital flight) - was accomplished. Primary objectives of the scheduled three-day mission were to rendezvous and dock with the Gemini Agena target vehicle (GATV) and to conduct extravehicular activities. Secondary objectives included rendezvous and docking during the fourth revolution, performing docked maneuvers using the GATV primary propulsion system, executing 10 experiments, conducting docking practice, performing a rerendezvous, evaluating the auxiliary tape memory unit, demonstrating controlled reentry, and parking the GATV in a 220-nautical mile circular orbit. The GATV was inserted into a nominal 161-nautical mile circular orbit, the spacecraft into a nominal 86 by 147-nautical mile elliptical orbit. During the six hours following insertion, the spacecraft completed nine maneuvers to rendezvous with the GATV. Rendezvous phase ended at 5 hours 58 minutes ground elapsed time, with the spacecraft 150 feet from the GATV and no relative motion between the two vehicles. Stationkeeping maneuvers preceded docking, which was accomplished at 6 hours 33 minutes ground elapsed time. A major problem developed 27 minutes after docking, when a spacecraft orbit attitude and maneuver system (OAMS) thruster malfunctioned. The crew undocked from the GATV and managed to bring the spacecraft under control by deactivating the OAMS and using the reentry control system (RCS) to reduce the spacecraft's rapid rotation. Premature use of the RCS, however, required the mission to be terminated early. The retrofire sequence was initiated in the seventh revolution, followed by nominal reentry and landing in a secondary recovery area in the western Pacific Ocean. The spacecraft touched down less than 10 km from the planned landing point. The recovery ship, the destroyer Leonard Mason, picked up both crew and spacecraft some three hours later. Early termination of the mission precluded achieving all mission objectives, but one primary objective - rendezvous and docking - was accomplished. Several secondary objectives were also achieved: rendezvous and docking during the fourth revolution, evaluating the auxiliary tape memory unit, demonstrating controlled reentry, and parking the GATV. Two experiments were partially performed. 1966 September 12 - . 14:42 GMT - . Launch Site: Cape Canaveral. Launch Complex: Cape Canaveral LC19. LV Family: Titan. Launch Vehicle: Titan II GLV. Gemini 11 - . Call Sign: Gemini 11. Crew: Conrad, Gordon. Backup Crew: Anders, Armstrong. Payload: Gemini SC11. Mass: 3,798 kg (8,373 lb). Nation: USA. Agency: NASA Houston. Class: Manned. Type: Manned spacecraft. 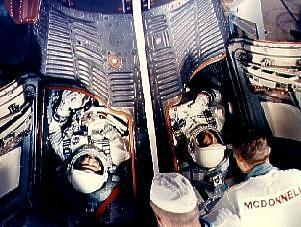 Flight: Gemini 11. Spacecraft: Gemini. Duration: 2.97 days. Decay Date: 1966-09-15 . USAF Sat Cat: 2415 . COSPAR: 1966-081A. Apogee: 280 km (170 mi). Perigee: 161 km (100 mi). Inclination: 28.80 deg. Period: 88.80 min. More highjinks with Conrad. First orbit docking with Agena, followed by boost up to record 800 km orbit, providing first manned views of earth as sphere. Tether attached by Gordon to Agena in spacewalk and after a lot of effort tethered spacecraft put into slow rotation, creating first artificial microgravity. The primary objective of the Gemini XI mission was to rendezvous with the Gemini Agena target vehicle (GATV) during the first revolution and dock. Five maneuvers completed the spacecraft/GATV rendezvous at 1 hour 25 minutes ground elapsed time, and the two vehicles docked nine minutes later. Secondary objectives included docking practice, extravehicular activity (EVA), 11 experiments, docked maneuvers, a tethered vehicle test, demonstrating automatic reentry, and parking the GATV. All objectives were achieved except one experiment - evaluation of the minimum reaction power tool - which was not performed because umbilical EVA was terminated prematurely. Umbilical EVA began at 24 hours 2 minutes ground elapsed time and ended 33 minutes later. 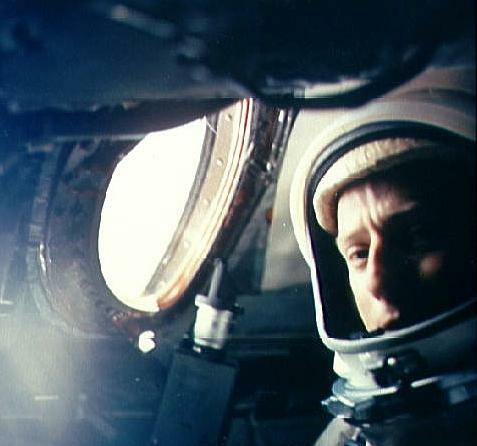 Gordon became fatigued while attaching the tether from the GATV to the spacecraft docking bar. An hour later the hatch was opened to jettison equipment no longer required. At 40 hours 30 minutes after liftoff, the GATV primary propulsion system (PPS) was fired to raise the apogee of the docked vehicles to 741 nautical miles for two revolutions. The PPS was fired again, 3 hours 23 minutes later, to reduce apogee to 164 nautical miles. The crew then prepared for standup EVA, which began at 47 hours 7 minutes into the flight and lasted 2 hours 8 minutes. The spacecraft was then undocked to begin the tether evaluation. At 50 hours 13 minutes ground elapsed time, the crew initiated rotation. Initial oscillations damped out and the combination became very stable after about 20 minutes; the rotational rate was then increased. Again, initial oscillations gradually damped out and the combination stabilized. At about 53 hours into the mission, the crew released the tether, separated from the GATV, and maneuvered the spacecraft to an identical orbit with the target vehicle. A fuel cell stack failed at 54 hours 31 minutes, but the remaining five stacks shared the load and operated satisfactorily. A rerendezvous was accomplished at 66 hours 40 minutes ground elapsed time, and the crew then prepared for reentry. 1966 September 15 - . Landing of Gemini 11 - . Return Crew: Conrad, Gordon. Nation: USA. Related Persons: Conrad, Gordon. Flight: Gemini 11. Spacecraft: Gemini. The spacecraft landed at 13:59 GMT less than 5 km from the planned landing point at 71 hours 17 minutes after liftoff. The crew was retrieved by helicopter, and the spacecraft was brought aboard the prime recovery ship, the aircraft carrier Guam, about an hour after landing. 1967 December 7 - . Astronaut Conrad concerned about an attitude control problem in the Apollo LM - . Nation: USA. Related Persons: Conrad, Slayton. Program: Apollo. Spacecraft: Apollo LM, LM Weight. Astronaut Charles (Pete) Conrad's concern about an anticipated attitude control problem in the LM was reported. Conrad had said, "The LM is too sporty when in a light weight configuration." Minimum impulse was expected to produce about 0.3 degree per second rate, which was estimated to be about four times too fast. A memo on the problem possibility was written by Howard W. Tindall, Jr., Deputy Chief of MSC's Mission Planning and Analysis Division, to stimulate thinking. On December 9, ASPO Manager George M. Low asked Donald K. Slayton and Warren J. North if there was any chance of setting up a simulation to see whether this was a real concern. Problem with the Apollo LM fuel -remaining light - . Nation: USA. Related Persons: Conrad. Program: Apollo. Spacecraft: Apollo LM, LM Descent Propulsion. Howard W. Tindall, Jr., Chief of Apollo Data Priority Coordination within ASPO, reported an operational system problem aboard the LM. To give a returning Apollo crew an indication of time remaining to perform a landing maneuver or to abort, a light on the LM instrument panel would come on when about two minutes worth of propellants remained in the descent propellant system tanks with the descent engine running at 25-percent thrust. The present LM weight and descent trajectory were such that the light would always come on before touchdown. The only hitch, said Tindall, was that the signal was connected to the spacecraft master alarm. "Just at the most critical time in the most critical operation of a perfectly nominal lunar landing mission, the master alarm with all its lights, bells, and whistles will go off." 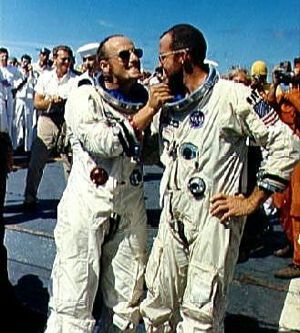 Tindall related that some four or five years earlier, astronaut Pete Conrad had called the arrangement "completely unacceptable . . . but he was probably just an Ensign at the time and apparently no one paid any attention." If this "is not fixed," Tindall said, "I predict the first words uttered by the first astronaut to land on the moon will be 'Gee whiz, that master alarm certainly startled me.'" Tindall recommended either rerouting the signal wiring to bypass the alarm or cutting the signal wire and relying solely on the propellant gauges to assess flight time remaining. 1972 January 19 - . A Skylab crew news conference; preparations on schedule for April 1973 launch. - . Nation: USA. Related Persons: Conrad. Program: Skylab. Spacecraft: Skylab. 1973 May 25 - . 13:00 GMT - . Launch Site: Cape Canaveral. Launch Complex: Cape Canaveral LC39B. Launch Platform: LUT1. LV Family: Saturn I. Launch Vehicle: Saturn IB. Skylab 2 - . Call Sign: Skylab. Crew: Conrad, Kerwin, Weitz. Backup Crew: McCandless, Musgrave, Schweickart. Payload: Apollo CSM 116. Mass: 19,979 kg (44,046 lb). Nation: USA. Agency: NASA Houston. Program: Skylab. Class: Moon. Type: Manned lunar spacecraft. Flight: Skylab 2. Spacecraft: Apollo CSM. Duration: 28.03 days. Decay Date: 1973-06-22 . USAF Sat Cat: 6655 . COSPAR: 1973-032A. Apogee: 440 km (270 mi). Perigee: 425 km (264 mi). Inclination: 50.00 deg. Period: 93.20 min. Epic repair mission which brought Skylab into working order. Included such great moments as Conrad being flung through space by the whiplash after heaving on the solar wing just as the debris constraining it gave way; deployment of a lightweight solar shield, developed in Houston in one week, which brought the temperatures down to tolerable levels. With this flight US again took manned spaceflight duration record. Skylab 2 , consisting of a modified Apollo CSM payload and a Saturn IB launch vehicle, was inserted into Earth orbit approximately 10 minutes after liftoff. The orbit achieved was 357 by 156 km and, during a six-hour period following insertion, four maneuvers placed the CSM into a 424 by 415 km orbit for rendezvous with the Orbital Workshop. Normal rendezvous sequencing led to stationkeeping during the fifth revolution followed by a flyaround inspection of the damage to the OWS. The crew provided a verbal description of the damage in conjunction with 15 minutes of television coverage. The solar array system wing (beam) 2 was completely missing. The solar array system wing (beam) 1 was slightly deployed and was restrained by a fragment of the meteoroid shield. Large sections of the meteoroid shield were missing. Following the flyaround inspection, the CSM soft-docked with the OWS at 5:56 p.m. EDT to plan the next activities. At 6:45 p.m. EDT the CSM undocked and extravehicular activity was initiated to deploy the beam 1 solar array. The attempt failed. Frustration of the crew was compounded when eight attempts were required to achieve hard docking with the OWS. The hard dock was made at 11:50 p.m. EDT, terminating a Skylab 2 first-day crew work period of 22 hours. 1973 June 7 - . 15:15 GMT - . EVA Skylab 2-2 - . Crew: Conrad, Kerwin. EVA Duration: 0.15 days. Nation: USA. Related Persons: Conrad, Kerwin. Program: Skylab. Class: Manned. Type: Manned space station. Flight: Skylab 2. Spacecraft: Skylab. Succeeded in release of jammed solar panel..
1973 June 19 - . 10:55 GMT - . EVA Skylab 2-3 - . Crew: Conrad, Weitz. EVA Duration: 0.0722 days. Nation: USA. Related Persons: Conrad, Weitz. Program: Skylab. Class: Manned. Type: Manned space station. Flight: Skylab 2. Spacecraft: Skylab. Replacement of film cartridges for solar camera..
1999 July 9 - . Astronaut Charles Peter (Pete) Conrad Jr dies at age of 69 -- Motorcycle crash. - . Nation: USA. Related Persons: Conrad.